These were found in a creek in SW Indiana. It is located about 40 min. NE of Evansville. These are some weird looking rocks! 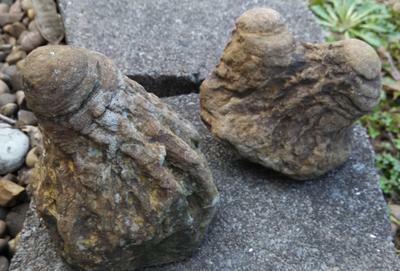 I don't know what you have here for sure but I will go out on a limb and guess that it could be upsidedown crinoids. There is some wear from the creek but it could be the caylex or aboral cup with the arms pointing down.